3. Add any desired information into the first section of the Community portion of the screen. 4. In the Initial Document Status field, select the appropriate status. Add any desired comments in the Status Comment field. Note: You can create additional HOA Document statuses under Admin>Statuses, using the HOA Document sub tab. Click here for more information. 5. In the Initial Demand Status field, select the appropriate status. Add any desired comments in the Status Comment field. Note: You can create additional HOA Demand statuses under Admin>Statuses, using the HOA Demand sub tab. Click here for more information. 6. 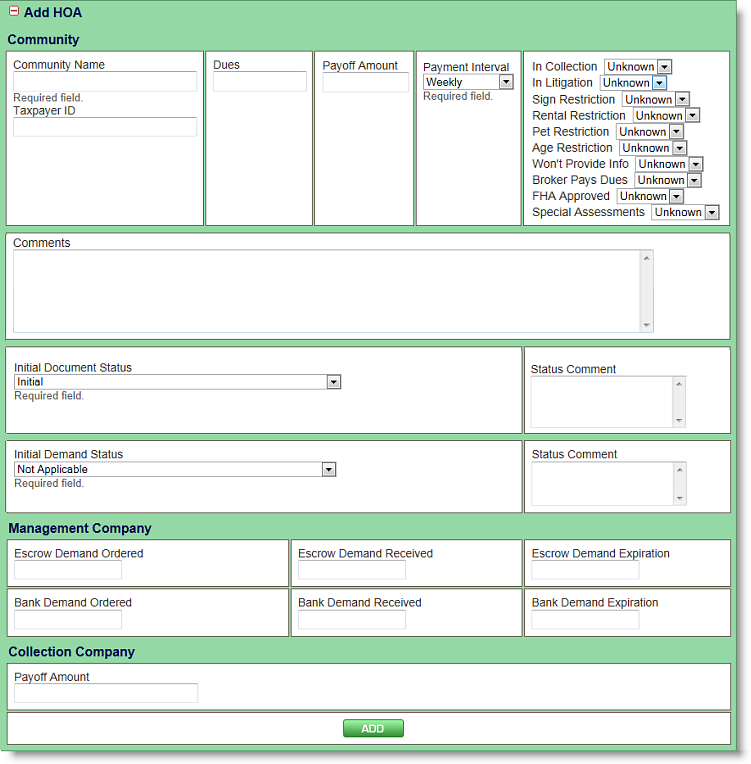 In the Management Company section, add in any Escrow or Bank Demand information. Note: Management Company information will be added later in a separate location. 7. If there is a known Payoff Amount, add this in the Collection Company section. Note: Collection Company information will be added later in a separate location. 8. Click the Add button. The HOA Community name will display in a bar beneath the Add HOA area with much of the information you provided shown in the gray area below. Note that any information with a YES next to it displays in red. To view more HOA information or to make changes to the information shown, click the + next to the Community Name to expand the HOA detail. To add or edit HOA information, type the desired information into the appropriate field and click the green Update button.